Board index ‹ Fishkeeping Boards ‹ Help! Get help on those urgent fishkeeping problems! I think its some sort of loach but could be wrong. This wee guy is has been the most active fish in my tank since I brought him home at the beginning of october. Over the last week he has just been lying around hardly moving or breathing. The odd time he swims itx just for a moment then sinkd to the bottom then just lies there. Hes grown fine and has a good belly on him so I cant think its because hes under fed or even over fed for that matter. Im worried anout him because its so unlike him to be doing nothing. Any thoughts. The other fish are all fine. No sign of illness or anything. Heres a wee pic to show the fish. 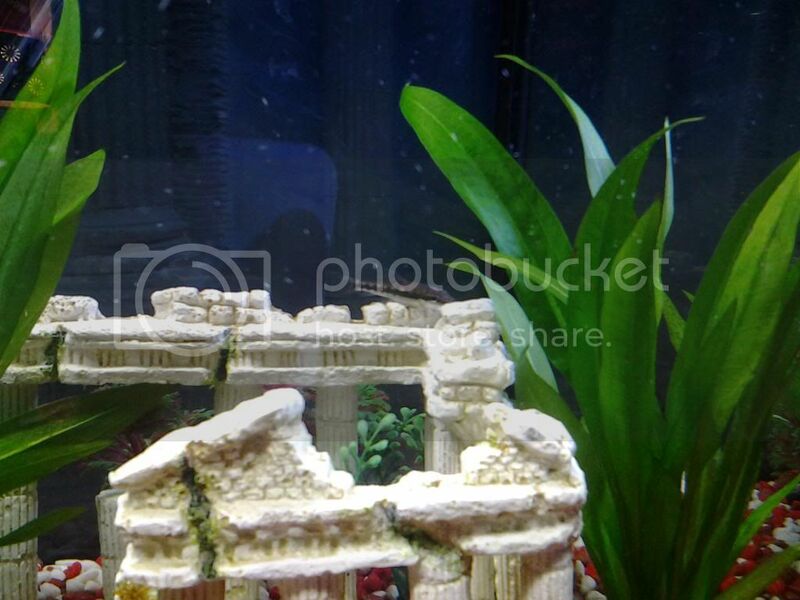 This is a dwarf chain loach, Ambastaia sidthimunki, and it is not a sucking catfish therefore you may not be providing it with the correct diet. It needs something with a protein base like shrimp pellets. These are very social fish and need to be in a group of at least 4, preferably 6. They can pine if on their own. These are streamlined fish and should never be fat. If it is starting to look fat it may have a blockage or the beginnings of dropsy. Dropsy is a symptom of internal organ failure as they start to retain fluid. I suggest you check the diet then add more of the same species, if possible. Thanks for the reply. He is on his own but does socialise with the guppys. Im sad to hear he might be depressed and tomorrow im heading out to get him some company. I wouldnt say hes fat but hes filled out since I bought him . I was told by my lfs that he only eats the algae the grows on the glass and other stuff in the tank so have never looked into getting a food for him. He normally hoovers up everything and im sure hes even broke the surface a few time's climbing the filter lol. I will enqire about a food for him when im in the pet store. That looks like a Otto to me, they do like to be in groups and are renowned for being hard to keep, especially in a new tank like yours. I got some a last year and they only lasted a month before showing similar symptons to you have described. I bought another 4 a couple of months back now my tank is mature and they have thrived since, actively swimming around in the evening and eating anything in the tank (flake food and cucumber). The fish in the picture linked appears to be a Chinese algae eater it will be reluctant to eat algae if it has food available that is easier to find. I'd say the Chinese algae eater is what he is. He's still going but doesn't have the same craziness about him lol. He's never came to the surface with the others for food and spends his days attached to something by his lips. I worry that by adding more of them there will be less for them to eat as, in my opinion, the tank is pretty clean with no obvious signs of algae growing. I assume there must be something for him to eat as he's still alive. Not sure how to proceed. Personally I would not add any more to your tank, they can be aggressive as they get older. Adding some blanched courgette could be an option as most algae eaters will eat this quite happily, you would only need to add a small amount to a lettuce clip. Ok I'll look into that in the morning. I assume that the other fish want mind that being in the tank. They will probably have a go at eating it too. Many fish eat, and like, a variety of foods. So it appears that he has sprung back into life and is back to his 100mph self which is a good thing. He had me worried for a while there. Thanks for all your help and advice with the matter. Il keep an eye on him to make sure he stays full of beans. Glad to hear all is under control now. Maybe worth leaving it for a week or 2 before adding more fish. Yeh I'm definitely not adding and for a while. Probably after new year.